Indonesia’s Tigerair Mandala is boldly slashing capacity by about 40%, hoping to lead by example as it responds to overcapacity and challenging market conditions. 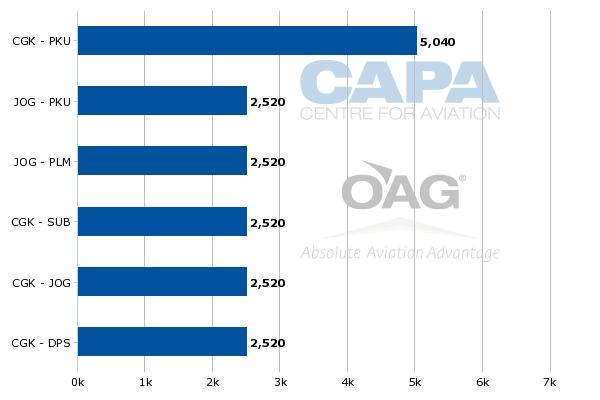 The capacity cuts will reduce the carrier’s average aircraft utilisation rate to less than nine hours, which is very low for an LCC operating a new fleet of A320s. Reducing utilisation is an unusual move in Asia’s low-cost sector, where expansion continues at an ambitious rate despite signs of overcapacity in several major markets including Indonesia. But reducing utilisation and even temporarily grounding aircraft is a more common response by LCCs in other regions during periods of low demand. More Asian LCCs should consider adopting the strategy used by leading European LCC Ryanair, which parks up to 80 aircraft every winter. So far only tiny Tigerair Mandala, which is roughly number 35 among the 47 LCCs in Asia-Pacific, has taken the initiative. Tigerair Mandala currently operates a fleet of nine A320s with an average age of just 1.5 years, according to the CAPA Fleet Database. All nine aircraft were sourced from Tiger Airways Holdings, which has about a 40% stake in Tigerair Mandala, and were delivered new since the carrier launched operations in 2012. Tigerair Mandala has not added any aircraft since Jul-2013, when its ninth A320 was delivered. Tigerair Mandala’s initial fleet plan envisioned 12 A320s by the end of 2013 and 18 A320s by the end of 2014. 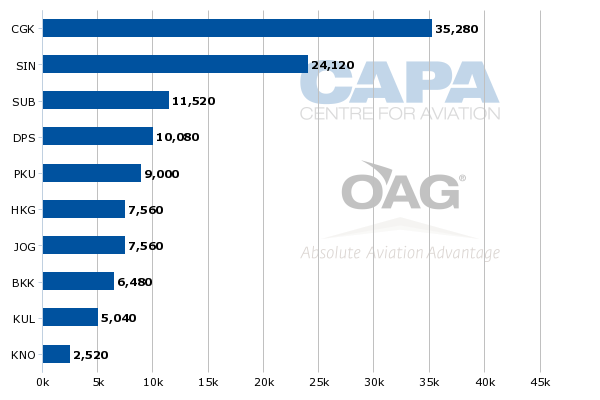 As CAPA reported previously, the fleet plan was earlier adjusted to include nine aircraft at the end of 2013 and 12 aircraft at the end of 2014. But Tigerair Mandala over the past month has again adjusted its fleet plan, dropping a commitment with leasing company SMBC to take three A320s (one new, one used and one undecided) in 2014. These three aircraft, including a used A320 which has been ready for delivery and is already in Tigerair Mandala livery, will now be remarketed. Tigerair Mandala no longer plans to add any aircraft in 2014 and instead will look at resuming fleet expansion in 2015. Renegotiating its commitment with SMBC is a smart move as the carrier restructures its network to focus on profitable routes, resulting in under-utilisation of its existing nine aircraft. Tigerair Mandala hopes to add back capacity in 2H2014, depending on market conditions, but does not need the burden of carrying additional aircraft under its new strategy of minimising losses by only operating routes that at least have a chance of being cash flow positive. Tigerair Mandala is taking a page out of the Ryanair playbook as it decides it is better having its aircraft sit idle during certain periods if the only other option is to operate unprofitable routes. Ryanair this winter is parking 70 737s – over 20% of its fleet – during the off-peak months. Last winter it parked 80 737s. Tigerair Mandala will not be parking any specific aircraft but utilisation rates will decrease by roughly 30% as the carrier will be operating only 30 daily segments with its fleet of nine aircraft, or an average of three and one third segments per aircraft. Tigerair Mandala began 2014 operating 52 segments on most days (some days it operated 54) with the same nine aircraft, or nearly six segments per aircraft. Prior to its network restructuring, about 60% of Tigerair Mandala’s flights were under two hours and nearly 90% are under four hours. While the total number of flights is being reduced by 42% and the number of routes operated is being cut by over 50%, Tigerair Mandala CEO Paul Rombeek tells CAPA that on an ASK basis the reduction is 30%. He expects average utilisation rates to remain above eight hours once all the last cuts are implemented in early Mar-2014, compared to above 11 hours at the beginning of the year. Under-utilising aircraft is not an uncommon strategy but is new for Asia. Besides Ryanair another well known example is US-based Allegiant Air, which has most of its fleet sit idle every Tuesday and Wednesday. It is somewhat easier for Ryanair and Allegiant to ground aircraft or reduce utilisation as their fleets are older and are partially unencumbered. 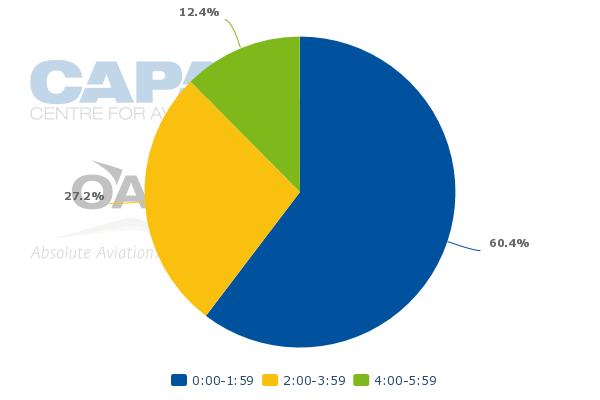 Ryanair’s fleet has an average age of 5.5 years and is 86% owned, according to the CAPA Fleet Database. Allegiant’s fleet has an average age of 22 years and is 92% owned. Asia’s LCC fleet is relatively new and aircraft which are owned are still encumbered. 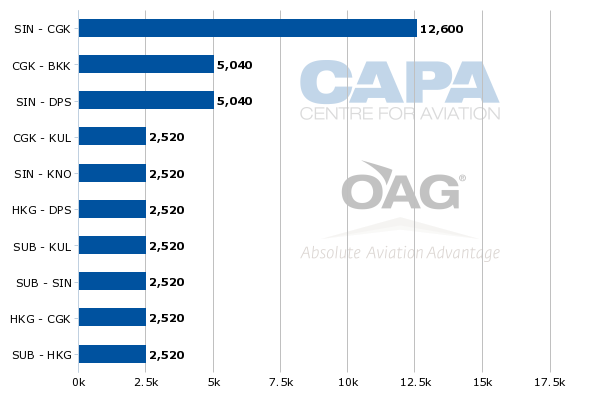 But as the Asian LCC fleet expands this year from about 1,000 to approximately 1,200 aircraft in many cases the more rational decision would be to reduce utilisation. While market fundamentals overall in Asia remain favourable for LCCs, including high GDP and middle class growth rates, the rate of capacity growth is outstripping demand. Overcapacity has particularly become an issue in Southeast Asia’s top four markets – Indonesia, Thailand, Malaysia and Singapore – leading to a slide in yields across both the low-cost and full-service sectors. The situation in Indonesia is exacerbated by the fall in the Indonesian rupiah, which declined by 26% against the USD in 2013 with most of the fall occurring in the second half. With most airline costs fixed in USD, the rapid depreciation led to a huge shortfall particularly in the domestic market where all revenues are collected in IDR. Other Indonesian carriers have made network adjustments but have not yet taken nearly as radical steps as Tigerair Mandala. Indonesia AirAsia is slowing down fleet expansion but is maintaining its average 13 hour aircraft utilisation rate. Indonesia AirAsia’s plans and outlook for 2014 will be analysed in a separate analysis report to be published later this week. Indonesia AirAsia is the most comparable carrier to Tigerair Mandala as both carriers allocate a majority of their capacity to the international market. Indonesia’s two other LCCs, Lion Air and Garuda budget subsidiary Citilink, predominately (in the case of Lion) or entirely (in the case of Citilink) operate in the domestic market. Citilink and particularly Lion also have the scale to reduce frequency on domestic trunk routes in response to unfavourable market conditions. As Tigerair and AirAsia typically have a tiny fraction of the frequencies that Lion offers, they generally have no choice but to drop underperforming routes entirely. Lion traditionally makes cuts by consolidating flights on trunk routes rather than reduce its scheduled capacity while Citilink has been making schedule adjustments. The AirAsia and Lion groups, which account for over two-thirds of LCC seat capacity within Southeast Asia, are generally not showing any signs of slowing down their pursuit of market share despite the challenging market conditions throughout the region. Lion is still planning to add 48 aircraft in 2014, including 30 in 2H2014, and expand rapidly in all three of its markets – Indonesia, Malaysia and Thailand. The AirAsia Group is also not expected to defer deliveries as additional aircraft originally allocated for Indonesia AirAsia will likely be re-allocated to new AirAsia franchises. In addition to launching in India, the group is pursuing new joint ventures in Korea and Japan. AirAsia X is also looking at resuming services to Europe later this year using its recently reactivated fleet of two A340s – another sign that the group is not afraid to take risks and build up its market share despite challenging conditions. Tigerair is a much smaller group and has been looking at potentially reducing utilisation at its core operation in Singapore. Over the next year Tigerair Singapore has to absorb five aircraft being returned from Tigerair Philippines as well as about three new aircraft. Reducing utilisation would be a logical move as the Singapore market is already experiencing overcapacity. But so far Tigerair Singapore has not decided to follow its Indonesian sister and is keeping utilisation levels up by using additional aircraft to open new medium-haul routes such as Singapore to Male in the Maldives (launched 26-Jan-2014) and Chongqing in China (expected later this year). See related report: Tigerair 2014 outlook gloomy following 3QFY2014 loss. Is there a silver lining in 2015? Tigerair Mandala adopted its new strategy of hunkering down and restructuring its network to focus on better performing routes in Jan-2014. The first route to be cut was on 8-Jan-2014, when Tigerair Mandala suspended its two daily flights between Jakarta and Medan, slightly reducing its aircraft utilisation levels and leaving the carrier with 18 routes (12 international and six domestic). A few weeks later Mandala completed its network review and identified another nine routes for the chopping block. Some of these nine routes were cut over the last week while the others will be cut by 3-Mar-2014. The nine routes being suspended include: Jakarta to Hong Kong, Kuala Lumpur, Surabaya and Yogyakarta; Surabaya to Bangkok, Hong Kong and Kuala Lumpur; Medan to Singapore; and Pekanbaru to Singapore. Tigerair Mandala is currently evaluating, along with parent Tiger Airways Holdings, cutting one other route, Surabaya to Singapore. Tigerair Mandala and Tigerair Singapore both operate the route with one daily flight. While the route has been underperforming it is strategically important to the group. A decision on whether to entirely suspend the route, drop one of the two frequencies or have both carriers continue with one daily frequency each is expected within the next few weeks. If Singapore-Surabaya is maintained, Tigerair Mandala will have nine routes (five international and four domestic) and 15 daily return flights (11 international and four domestic). The other eight routes being retained are: Jakarta-Singapore (five daily flights being reduced to four); Jakarta-Bangkok (two daily flights); Jakarta-Pekanbaru (two daily flights being reduced to one); Jakarta-Bali (one daily flight); Bali-Singapore (two daily flights increasing to three); Bali-Hong Kong (one daily flight); Yogyakarta-Pekanbaru (one daily flight) and Yogyakarta-Pekanbaru (one daily flight). If Singapore-Surabaya is cut, Tigerair Mandala will abandon Indonesia’s second largest city entirely. Prior to the first of nine route cuts being implemented the week commencing 10-Feb-2014, Surabaya was Mandala’s third largest destination behind Jakarta and Singapore. Tigerair Mandala is also entirely cutting Kuala Lumpur but plans to look at restoring service to the Malaysian capital later this year. Two and potentially three of its five routes to Singapore, which is by far the carrier’s largest international destination, are being cut. Hong Kong is being cut from three to one route and Bangkok from two to one route. Note: Tigerair Mandala had 12 international routes prior to the recent restructuring. The two routes not displayed here are Pekanbaru-Singapore and Surabaya-Bangkok, both of which were served with four weekly return flights. The cuts at Hong Kong are perhaps the most surprising as Tigerair Mandala had been very optimistic about the Indonesia-Hong Kong market as it was previously not served by LCCs. Daily Jakarta-Hong Kong service was launched in Jul-2013. The route appeared successful, leading to the launch of daily services from Bali and Surabaya to Hong Kong in Dec-2013. But Jakarta-Hong Kong suffered as Taiwan’s China Airlines, which operates 10 weekly A330 flights on a Taipei-Hong Kong-Jakarta-Hong Kong-Taipei rotation, responded aggressively to Tigerair’s entrance. Surabaya-Hong Kong performed better as Mandala was the only carrier serving the market non-stop but the market proved to be too small. Bali-Hong Kong has performed the best of Mandala’s three Hong Kong routes. It is a competitive market – with service from Cathay Pacific, Garuda and Hong Kong Airlines – but is a much larger and fast-growing market. The Bali-Hong Kong market also consists almost entirely of inbound tourists, giving Tigerair Mandala a hedge against the weak rupiah. Its other Hong Kong routes relied mainly on Indonesian worker traffic. The carrier’s Kuala Lumpur flights were also majority sold in Indonesia while its Singapore flights have a more even mix in terms of Indonesia and Singapore point of sale. Thailand flights are predominately sold in Indonesia. While Mandala is keeping one of its two Bangkok routes, it is striving to increase its non-IDR revenue stream as it restructures its network. In this regards, Bali flights are the most attractive as it is almost entirely an inbound market. Bali is the only destination in Mandala’s network not impacted by the restructuring. In fact capacity to Bali is increasing from four to five daily flights as Singapore-Bali is being increased from two to three daily flights. Mr Rombeek says Mandala will look to increase capacity on some of its other retained routes as market conditions improve. The rupiah has stabilised in the last couple of months and fares are starting to inch up, giving Mandala some optimism it will be able to restore within a few months at least some of the capacity cuts. The carrier is now looking to further increase fares and is hoping larger competitors will follow its lead. While the rupiah has now stabilised, fares have not yet come up enough to offset the increase in costs caused by the devaluation from 2H2013. In addition to adding capacity on some of the eight or nine retained routes, some of the suspended routes could be resumed in 2H2014. Mandala will in particular need to look at restoring the four routes cut at Jakarta, or adding new Jakarta routes in their place, in order to retain its Jakarta slots. The carrier for now has not had to give up any of its Jakarta slots although the restructuring has allowed it to focus on using its best slots. The Tigerair Group in particular has focused on improving the timings of its flights in the highly competitive Jakarta-Singapore route, which continues to be the group’s largest route with eight daily flights (four from Tigerair Mandala and four from Tigerair Singapore). Tigerair Mandala has been very clear at communicating that it is seeking a more rational marketplace and its restructuring should not be taken as a sign that it is on the cusp on bankruptcy. Indonesian consumers are wary of airline bankruptcies as several carriers have gone bust over the last several years – including the original Mandala in early 2011, Batavia in early 2013 and Merpati in early 2014 – leaving consumer with unfulfilled tickets. Mandala has made sure to cancel routes with notice and re-book passengers (via Singapore for international itineraries) and offer full refunds. The carrier has been trying hard to avoid any damage to its brand, believing it will grow again once market conditions improve. Mandala’s competitors however will try to capitalise on the carrier’s restructuring by increasing market share on the impacted routes and trying to persuade passengers and travel agents that Mandala is on thin ice. Mandala indeed is trying to shore up its financials and minimise losses because its two main shareholders – Tiger Airways Holdings and Indonesian investment firm Saratoga – are reluctant to inject a large amount of new capital. But the reduction in capacity and aircraft utilisation is also a logical response to a challenging market which is unprofitable for nearly every airline. Virtually any seat or ASK added at this point comes with a loss, making lower utilisation a rational move. Unfortunately for Tigerair Mandala, most competitors are not likely to follow. Market conditions in Indonesia may improve slightly but overcapacity will continue to be a theme for the rest of 2014. Consolidation is the most likely outcome. 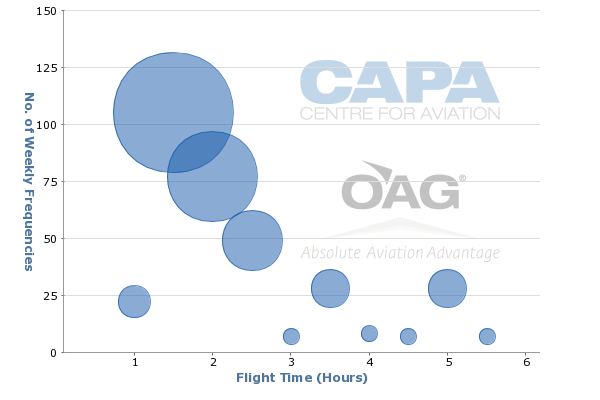 In a second analysis report to be published later this week, CAPA will analyse how Indonesia AirAsia is responding to the current challenging market conditions.